If you accept payments from customers in cash, you will surely be asked for a receipt at some point. There are cash receipt books you can get from your local office supply store, but you can also customize and print your own receipt forms using our free Cash Receipt Template below. If you don't have Excel, you can download the printable PDF form instead to print out some receipts to fill in by hand. Though this cash receipt form works for rent payments, you can also download our rent receipt template which is customized specifically for tenants/landlords. This is a general cash payment receipt form (3 receipts per page) for payments made by cash, check, or money order. Includes an optional Balance Due section. The receipt should be signed in the "Received by" spot to authenticate the receipt. This is an editable PDF file, so you will need Adobe Reader to view, edit, and print it. It is designed for making 3 duplicate copies of the same receipt. Fill in some of the information that will be the same for every receipt, and then print a bunch of blank copies. 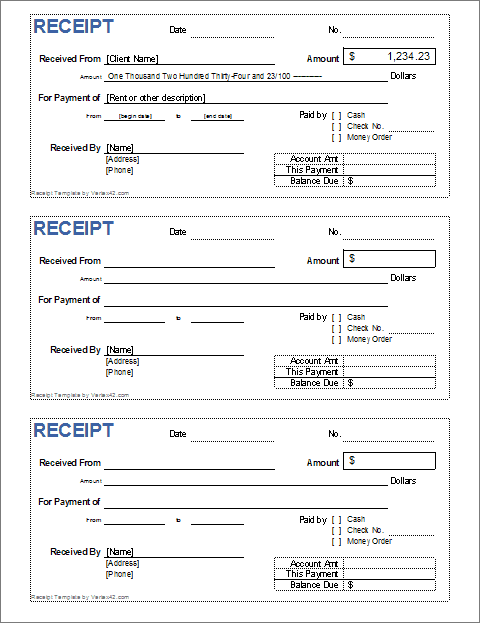 The Cash Receipt Template lets you create 3 receipts per page for cash, check, or money order payments. One really cool thing about this template is the custom formula that we created for automatically entering the written form of the amount. You just enter 1234.56 in the Amount field, and it automatically enters "One Thousand Two Hundred Thirty-Four and 56/100 -----." Besides general cash payments, this template also works for rent receipts. You can enter the rent period in the From and To fields and include the property address in the For Payment field. Print Receipts on Perforated Paper - Our 3-to-a-page receipt forms and receipt templates are designed for printing on Perforated 8.5" x 11" Paper (1 col x 3 rows). You can order paper from PerforatedPaper.com or some other office supply or paper supply company (Vertex42.com is not affiliated with perforatedpaper.com). Copies of Receipts - If you want to save duplicate or triplicate copies of the receipts, you can customize the template so that the cells/fields in the second 2 receipts refer to the values listed in the first receipt. Then, when you print the page, you'll have a couple "carbon" copies (This is what the PDF form does). Signing Receipts - Update 2/8/2016: To help prevent people from creating fraudulent receipts, you may want to customize the receipts you give (to make them difficult to duplicate) and also sign the receipts. For this reason, we've added signature lines to the newer versions of the templates.